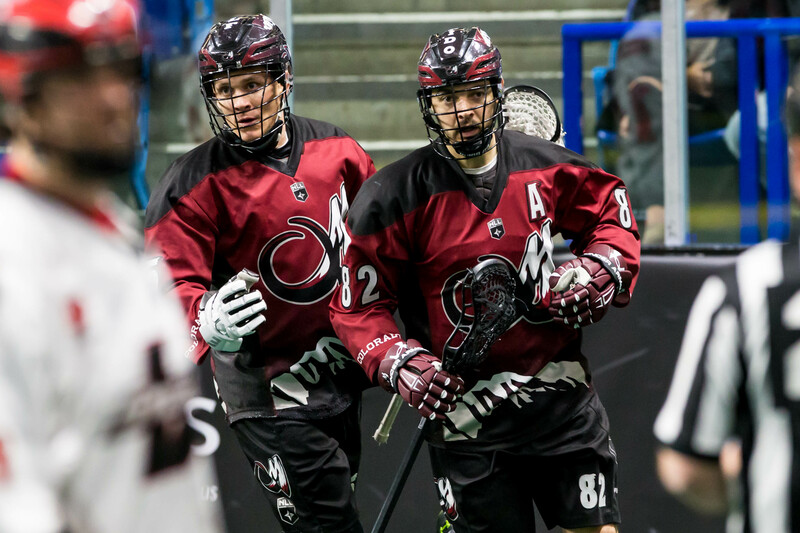 Saturday night the Colorado Mammoth (9-3) defeated the Vancouver Stealth (1-12) 13-10 at the Langley Events Centre. The win, Colorado’s fifth in a row, brings them closer to a home playoff game as they hold a four-game lead over Calgary with six games remaining. Colorado also holds the tie breaker by winning the season series 2-1. Any combination of Colorado wins and Calgary losses equaling two will guarantee the Mammoth at least one home playoff game. Colorado started out very quick and wanted to leave no doubt who the better team was on this night. Joey Cupido started the Mammoth scoring just 23 seconds into the contest, earning the 100th point of his career. Jeremy Noble would net the next two, one on the power play and the Mammoth jumped out to a 3-0 lead. Tony Malcolm would finally get the Stealth on the board just 96 seconds later to gain a little momentum, but Stephen Keogh would score two minutes later and give the Mammoth a three goal lead after the first quarter. The second quarter was a battle up and back. Pat Saunders cut the lead in half in the first two minutes, but then the Mammoth replied with two goals of their own to regain any momentum they may have briefly lost. But this Vancouver team never gives up as Rhys Duch and James Rahe scored 56 seconds apart and the Stealth crawled within two at 6-4. The Mammoth would get their three goal lead back in the final 15 seconds on the powerplay to end the half 7-4. As the second half started the Stealth came out on fire scoring the first three goals and tying the game at seven. Joel McCready would score twice and Logan Schuss would score the other. Rhys Duch also picked up an assist on each of the goals. As quick as they had the momentum they lost it just as fast. Eli McLaughlin would score to end the third quarter, but the Stealth were only be down by a goal. McCready got the hat trick at 1:19 of the fourth, but the Mammoth would counter with two goals of their own to stop any type of run the Stealth wanted. The Stealth scored short handed as Malcolm beat Dillon Ward, but again the Mammoth would score twice to counter. Corey Small would score with the extra attacker, but Cupido ended the game with an empty netter. Joel McCready (3G) and Tony Malcom (2G/3A) led the offense for Vancouver. Eric Penney stopped 42 of 54 shots faced. This was the Stealth’s eighth loss in a row, and they are all but mathematically eliminated from this year’s playoffs. Colorado had nine different goal scorers. Eli McLaughlin, Joey Cupido, Jeremy Noble and Stephen Keogh all registered a pair of goals. Noble and Keogh chipped in with two assists each. Dillon Ward stopped 49 of 59 shots faced. ← Knighthawks on track for playoffs?